An important aspect of a modern data architecture is the ability to use multiple execution frameworks over the same data. By using open data formats and storage engines, we gain the flexibility to use the right tool for the job, and position ourselves to exploit new technologies as they emerge. This article will demonstrate the use of two separate storage engines, HDFS and Cassandra, coupled with multiple execution frameworks, including Spark, Spark Streaming, Spark SQL, Impala, and CQL. Kafka will be used for scalable fault tolerant data ingestion. The ideal scenario would be a single copy of the data to serve all our data needs, but this is very difficult to achieve because the underlying architectures that serve high-volume, low-latency OLTP needs are fundamentally different from those needed to serve the large table scans required in analytical use cases. For example, Cassandra purposely makes it difficult to be able to scan large ranges of data, but allows for low-millisecond access of millions of records per second. On the flip side, the fundamental storage pattern in distributed file systems like HDFS purposely does not index data to allow for low-millisecond access, but uses larger block sizes to allow for very fast sequential access of data to scan billions of records per second. Streaming engines like Spark Streaming help mitigate the problem by allowing analytics to be performed on the fly as data is ingested into the system. 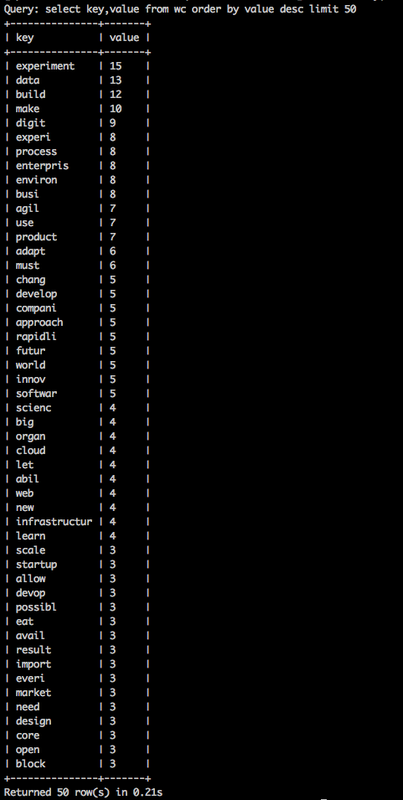 But when is the last time you were able to predict every metric that needed to be calculated at project inception? Thus lambda architectures have arisen to allow metrics to be added down the road by recomputing history. One important characteristic of a good lambda architecture is that the system needing to re-compute history should be able to operate quickly on a large dataset without disrupting performance or the low-latency user traffic. Therefore, in this example we have chosen to store that copy of our data in Parquetformat on HDFS, whereas for the low-latency user traffic, the example uses Cassandra. At the time of writing, earlier versions of Spark were bundled with both CDH 5.1 and Datastax 4.5, but I needed capabilities only available in Spark 1.1 and I had a pre-Datastax 4.5 cluster, so I installed Spark separately. To expedite examples a single node deployment was used, but each feature has been run on multi-node environments as well. Make sure that the Spark master hostname is the first entry in /etc/hosts to mitigate bind issues. All of the jars above were available for download except for spark-cassandra-connector_2.10-1.1.0-SNAPSHOT.jar, which I built using these instructions. 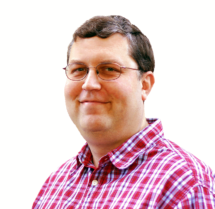 This scenario will start with a python script that will read an example document (my colleague, Edd Dumbill’s article on The Experimental Enterprise). The python script will publish the data to Kafka. A continuously running Spark Streaming job will read the data from Kafka and perform a word count on the data. 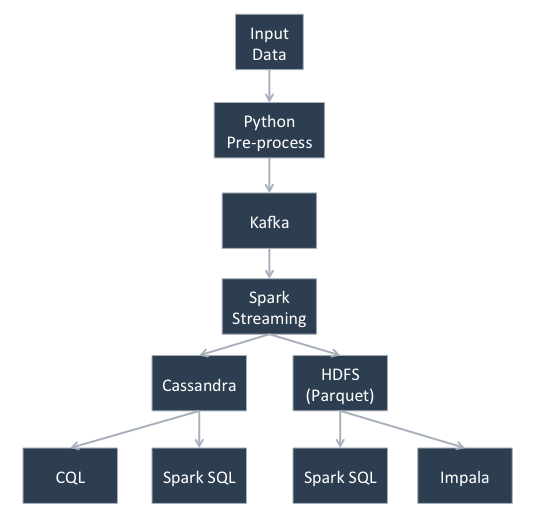 The Spark Streaming job will write the data to Cassandra. The Spark Streaming job will write the data to a parquet formatted file in HDFS. 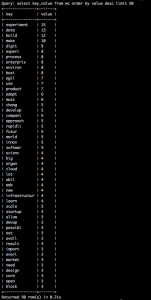 We can then read the data from Spark SQL, Impala, and Cassandra (via Spark SQL and CQL). 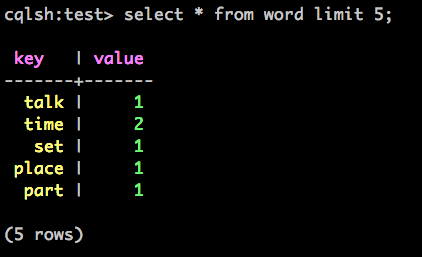 I added basic optional logic here to do NLP on the text like stemming and removing stop words using NLTK, but not necessary for non-text workloads in which records can be sent directly to kafka without any pre-processing. Once the data has been processed by spark streaming it can then be accessed in multiple ways. This code snippet shows how to read a given partition of parquet data in HDFS from the spark-shell. This code snippet shows how to read a given partition of parquet data in HDFS from Impala. This query shows how to read data from Cassandra using CQL. Note: with the simple Cassandra table design it was not possible to run order by. 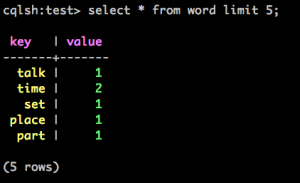 This code snippet shows how to read data from Cassandra from the spark-shell. We have only scratched the surface of how this process can be used to solve multiple data engineering problems. Hopefully this post provides some good working examples of getting these systems playing nicely together. There were several small examples on the web of setting up individual pieces of this data pipeline, but none that I found got them all working together in one place, which had its challenges. I was also unable to find many references on running standalone Spark against a Cassandra cluster, except through the native Datastax deployment starting in 4.5. Hopefully this provides an alternative for some users who are unable to upgrade or have other constraints. Richard has been at the cutting edge of big data since its inception, leading multiple efforts to build multi-petabyte Hadoop platforms, maximizing business value by combining data science with big data.